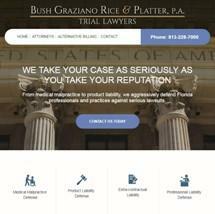 Our Tampa based law firm has built an imposing portfolio of clients, an enviable trial record and an unimpeachable reputation as a force in the judicial system. Practicing our craft in an efficient, cost effective manner, we offer our clients a broad range of services that protect and defend their interests with vigor and passion. We offer sound judgment, a wealth of experience and a dedicated team of attorneys, all of which combine to provide the best legal representation available. Civil Trial Practice in All Florida State and Federal Courts - specializing in Medical Malpractice Claims, Product Liability Claims, Professional Liability Claims, Long-term Care Claims, Securities Claims, Environmental Claims, General Commercial Claims, and Administrative Proceedings. In today’s world, the criteria clients use to select their attorneys vary greatly. While technical legal expertise and experience are vital, clients also want their attorneys to be responsive and to possess sound judgment. We are a group of experienced trial attorneys who enjoy the inside of a courtroom. At the same time, however, we understand the true cost of litigation, not only in the dollars spent in legal fees and costs, but also the toll it takes on our clients and their employees in diverting attention and resources away from their lives and businesses. In order to most effectively serve our clients, therefore, we evaluate every case within the first 90 days, offer candid advice and analysis, and provide strategic recommendations for either resolving a case quickly, where warranted, or proceeding to trial efficiently and effectively. We pride ourselves on keeping our clients informed of even the most minor developments in their case and working with them to ensure cost-effective representation, accomplishing only those tasks necessary for advancing the case. Each of our senior lawyers has been awarded an “AV” rating by Martindale-Hubbell, which is the highest rating an attorney can attain. We are large enough to handle complex cases, yet small enough to provide personalized service.